Men's Apparel Handmade. Shipped Direct. I couldn't be happier! My husband purchased a pair several months ago and we both love them. I ordered this pair as a Christmas present and didn't know what length he ordered. Customer service was very responsive and helpful! TIFFANY B. My wife loved my first pair (blue jeans) so much, she insisted I get some more - I don't have to be asked twice! I wanted to check out the khakis, and these are just as great. Amazing fit and comfort. I'll be getting more! CHRISTOPHER L.
This is my third pair of these jeans (first in khaki). I love them. It's a great fit (not too skinny, not too baggy), and I really like that the khaki is a bit different while still practical / durable. GERALD K.
Great job DD. Rise, finish, proportions and custom hemming is done perfectly! A real Pair of jeans that are well thought out for design and comfort. Kudos in this world of Jean options! MARIA S.
Perfect Smart Casual Jean that is American Made! Recent purchase of 34x31 size Tailored Fit-Khaki. Fit is exceptional even though I have larger legs from cycling. Thank you for making a superior product that is US made! LEONARD C.
Love these US made jeans! This is my second pair of the khaki denim that I have purchased. Awesome quality, fit and finish. The only denim I will purchase going forward. WILLIAM T.
I usually don't write reviews about things like this but these pants exceeded my expectations. Very high quality at an excellent price. JEFFERY M.
Had previously ordered on line and loved the jeans I received. Made a point of going to the store and the experience was even better MICHAEL R.
Awesome people to deal with. Had trouble with sizing issues and was given great customer service and quick responses. I love the jeans and recommend this company very highly. STEVE S.
They look great with an in style shape! The stretch material looks like an authentic jean but, has "give" or stretch that feels awesome when I move! Only jeans I wear now! GREG M.
I bought a pair of these for my husband for Christmas, and he says they're the most comfortable jeans he's ever worn. I'll be getting him another pair! AMANDA K.
I really like these jeans. They look good, they are extremely comfortable, and they fit very well. Will definitely buy again. MICHAEL M.
These jeans are more comfortable than my sweats. I always recommend these jeans to family and friends. ROGER P.
The jeans run true to size. I'm not usually a fan of tailored fit, but the material was surprisingly comfortable not what I had been used too. Great quality for less than the jeans I used to spend more on for years and that weren't American made. DOUG C.
I love these jeans! First of all black is classy. And these look and feel sharp. They fit differently than the dark wash, but I like the way these jeans feel. STEVE D.
Just bought my third and fourth pair, I loved the first two so much. These are the most comfortable jeans I've owned, and I love they way they fit and look... DAVE V.
Have blue jeans, black and khaki. Same fit. Great for me. They fit around my bigger middle yet not baggy around my thighs and nicely tapered to the ankles. DAVID W.
The jeans are great. A little lighter weight than what I expected but are they comfortable. Good construction, too. Now my go-to pairs. THOMAS T.
Most comfortable jeans I own! I love Dearborn Denim. They fit great, and they're the most comfortable jeans I own. For the money - these are a great value! JASON B.
Im a 6'4 PRESTON N.
The jeans fit fantastically, so the fitting app did its job. It also appears the makers factored in washing and drying shrinking them slightly, so the end result is a nice pair of jeans you can wear casually with a t-shirt or dressed up with a button down. BILL A. Great jeans, especially for the price! They're a little on the thin side, so they make great, flexible work jeans. I've paid upwards of $130 for similar jeans. I'll definitely be getting more of these when I need them. COREY S.
I was skeptical even after seeing them arrive, then I tried them on, looked in the mirror, and spent a day at the office in them. Lots of compliments, very comfortable, and what a price! Will buy again GAVIN D. ...They're really comfortable, fit well, look good, and really affordable for their quality. I'll definitely buy another pair from Dearborn Denim the next time I need a new pair of jeans. CLEMENT L.
They claim that they are the most comfortable jeans you will own. They are. The rest of my jeans are unlikely to see the outside of my closet. RICHARD S.
Love em so far...and they are just getting better! First pair of Dearborn jeans and I am impressed. The fit calculator was pretty spot on and the description that they may fit a little snug is correct as well... the price is unreal for made in the USA :) hopefully you are able to keep it near this price - nice work! BEN H.
Incredibly fast processing and shipping. My new go to for jeans. Both the 100% cotton and the stretch fabric variations are great. I currently have the tailored fit and will order some relaxed fit for some variety. TODD M.
Possibly the best I've owned. They fit extremely well, top to bottom. Experience was great as well, makes what normally is a "close enough" experience in Jean buying to something that actually fits. CARL G.
Nice jeans,they fit me well. I really like the fact that I can purchase in the 35" length. These are my favorite jeans. I also bought and recommend the belt. SCOTT P.
Great jeans. This time I ordered the 100% cotton tailored in both vintage and dark wash. Just right weight of denim and they fit great. DANIEL P.
The most Perfect flattering fitting jeans ever. A tad more room than 511's and a perfect rise. BRENDAN O.
I love the way these jeans fit, I love the quality and I love the price. I have other jeans that are 2-3 times the price and I much prefer Dearborn Denim over the other brands. I would definitely recommend giving them a shot. My guess is that you'll go back for more. I did. SCOTT A.
I was happy to find a company that is still making denim jeans in the US and hoping they would fit well. They not only fit well but the denim is first rate. Very comfortable. Definitely will be a repeat customer. ROGER K.
I started buying these jeans because from other places I was always having to have my jeans heamed and they would end up in proportional. With these I get jeans that that fit with no alterations needed. RICHARD J. Both the blended and 100% cotton are great. Modern fit unlike some of the legacy brands. Made in the US. Thank you JEFF S.
These are a little stiffer than the other Dearborn jeans, they should last for a while and fit well. REMY S.
This place is amazing. Friendly staff on N. Clark. Great, helpful, fun service. Very attentive. DANIEL R.
I now have three pairs of DD&A jeans. These are truly the best fitting jeans I've ever owned. FRANK C.
I've got other slim jeans -- these aren't quite as AARON C.
My new favorite pair of jeans ! I've been looking for a good quality American made jean for awhile now . I've had these jeans for about a week and washed then twice and they did not fade , shrink or wrinkle out of the wash . DON B. Ordered the same size I would buy in Levis and they fit perfect. The denim is super comfortable and light. Only got the chance to wear them a few time but definitely plan on picking up more. CONNOR R.
First time I've ever ordered any kind of cloths thru internet and was great and you guys kept me notified, completely 5*****. Will use you again for sure! Jahred R Boyd JAHRED B. These are so comfortable and I get so many compliments. Also, getting them custom hemmed in the store is a nice touch! Will definitely buy more pairs! JON C.
Perfect fit. Looks great. I also get to know that the people who made my jeans are paid a fair wage. DANIEL P.
Absolutely AWESOME American made jeans! Rarely do I find I product that D G.
Simply the best fitting, most comfortable jeans I own. I have many, more expensive pants that I'm not wearing anymore since I received the Dearborns. Also the sizing is not here to please your ego. 33in means 33. Not 35. REHOUVEN L.
Super well-made denims, made from US denim in a US factory and tailored to order for about $60 a pair. I've worn a pair daily to work for over a year and they are still like new. Incredible cslue and they look great. ANTHONY K.
Fantastic fit, comfort, and style. I've been looking for a pair of jeans like these for a long time. My odd sizing makes jean shopping tedious. These came in perfect. I look forward to buying the other washes. FABIAN S.
Skinny but not skin tight. I really good look for someone looking for skinny jeans, but not too tight in the waist. Snug for sure, but a great fit. The stretch is the best. I am very happy. MATTHEW S.
Bought them for my son. He says: Love that these are made in Chicago. The slim fits well, and looks great, but the regular cut is better for work, since I do a lot of bending and crouching. (He a cabinet maker). AMY M.
Was sick of buying pants manufactured overseas that only survived several months before falling apart. Dearborns are durable and comfortable, and buying in-store was the easiest clothes shopping experience ever. ANDREW C.
These jeans were a perfect fit for my tall skinny guy! Wash great with minimal shrinkage, keep shape, look great! Will definitely be back for more. BEN S.
These are really nice. They fit well, look good, seem really well made. For the price these are an excellent value and addition to my wardrobe. ROBERT E.
I love these jeans. I love the personal hemming and the smooth stretchy feel of the jeans. KEVIN S.
The company continues to exceed my expectations! This is my third pair of pants from them and I am sure it will not be my last. Great CS and easy exchanges for those of us who thing we maybe a little thinner then we really are :) JASON F.
These pants fit as expected and can be used for casual wear or for work. Have been super durable so far and fit wonderfully. So awesome to have a company that makes tall skinny pants (31x35) without charging extra. BENJAMIN G.
Bought one pair on Monday and by the end of the week I had three. The fit is great, stitching solid, and custom hemming? Can't beat it. Honored to have to stumbled upon this gem of a store BRYCE D.
Ever since I discovered Dearborn, it's been the only place I buy jeans and khakis. They're a great company, and they make great clothes. ANDREW M.
Travelling with a new pair, comfortable and breaking in nicely. These are fairly thick, so good for cold weather. STUART H.
Jeans are holding up great. Just recently bought another pair, and plan on many more! LINCOLN S.
Love my new Dearborn Denims! 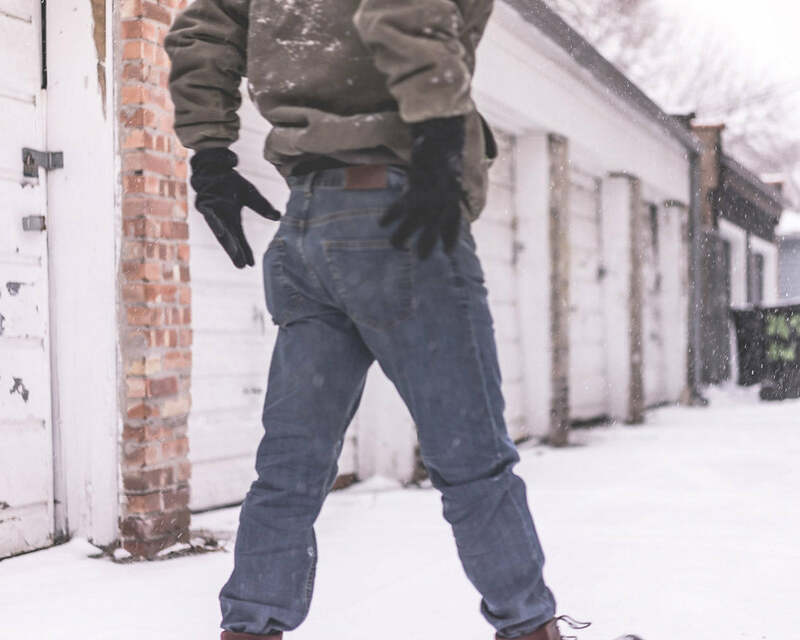 There is such a noticeable difference in quality in the jeans and also in the in-store experience when buying at Dearborn Denim. I've recycled my old jeans now that I've discovered my local, hometown favorite. TOM S.
These jeans were my 5th pair of Dearborn Denim and first in this fit. These are great when I don't want a trimmer leg jeans (like when wearing long underwear for cold Chicago winter days). ROBERT S.
Took my chance and tried these out, loved they were made in the US (not for political reasons). Great quality and comfort! DENNIS I.
I am very pleased with everything. From shopping to shopping the process was simple and reliable. The jeans are amazing. KEVIN W.
Bought these for my husband for Christmas. He loves everything about them. Well made, great fit! KATHRYN H.
Was sold on the fact of made in the USA, and was alright paying a little more for better sizing and quality made jeans, Dearborn Denim and Apparel did not disappoint! I will never buy my jeans from anywhere else! Quality handmade prodouct! JAMIE K.
Excellent product, just a little lighter weight than I expected but they are nice fitting and comfortable to wear. Will definitely be buying more. STEPHEN B. These are my 3rd pair of jeans from Dearborn. Fit and material continues to be great quality, and the finish and handiwork is now top notch. RUFFY Z. Great jeans! They fit great and are super comfy. Shipping was quick and everything arrived as expected. PATRICK B.
Incredibly confortable jeans. Bit thinner than other brands, but haven't noticed any downside to this. MATTHEW R.
Super comfortable jeans. Fit perfectly and look great. A quality product all around. IVAN R.
Do not know what to say other than these jeans fit perfectly, look great, feel great and the pocket arrangement is spot on! I look to buy a pair a month and stockpile them for the years to come. Keep up the great work Dearborn! IGGY D.
These jeans are thicker than your other blue denim and I love them! I wish you made some blue denim with the same sturdiness as these instead just the stretch fit jeans. CHRISTOPHER H.
Got these for my husband. These well-made jeans fit him perfectly! We've tried various makers and they are the best jeans yet! Love the material. They look great on him! C. P.
First time buyer but not the last. Bought the Relax Fit Khaki jeans and found them incredibly comfortable right out of the package. My first purchase from Dearborn but definitely not my last. WILLIAM G.
First rate materials and fit. I have two pairs of Khakis and two pairs of jeans. Will be placing another order soon. ANTHONY M.
Fit is excellent. I like the color variations. Only minor issue is that the fabric holds wrinkles. RICHARD B. Best jeans ever - great fit, well made, durable, and the most comfortable jeans to wear day in and day out. ironing is a breeze! Great product and service. PETER B. Nice looking and fitting well made jeans. I like the fact that they are made in the USA with mostly all US milled fabric for a reasonable price. MARIO B. They are exactly what I wanted and the right sizes and length. I will use you company again. I get lots of compliments on my Black Jeans. MARVIN M.
Really enjoy these. I've now got the blue jeans, the black ones, and the khaki. All great additions to my wardrobe. Glad I found these. MICHAEL J.
I just like them- there my go to style - have several pair now- dress them up or down- for me they work and play- JAMES H.
They felt great and fit very nice, I like them because they are a lighter weight than the black kakys I have DAVID J. The black relaxed fit jeans fit me perfectly and look great. I like the light weight and smooth feeling too. HAROLD W.
Dearborn jeans are comfortable, well-made, and fit beautifully. Keep up the good work, guys! IVAN R.
Great jeans, made down the road. Sturdy pants, great fit, well made. These jeans look great and fit me well. The denim is a nice heavy weight. The stitching is good and I love wearing jeans made by Americans who live in the same part if the country as me. MICHAEL C.
Finally can get old school denim! Purchased for Christmas Gift to Father-in-law, loved'em!! Size was good, fit was excellent and he was very happy to receive these. I heard about your company on the radio, XRT and ordered. Customer service was excellent! TERESA S.
Love, love these...I have 2 in dark blue, 1 in black and 1 in tan. I have the relaxed fit and they are GREAT!! FRANK S.
I've finally found good looking comfortable jeans at a very reasonable price AND they're made in America! REG C.
Very pleased with the two pair of jeans I received and I will certainly order from them again. JOHN M.
Purchased one pair to try when I heard about jeans being made in USA and price was right. I was very very pleased, I ordered size I normally purchase and they fit great no issue. I will be ordering all my jeans going forward Dearborn Denim MIKE M.
Best Jeans that I have ever owned!!! What a find! Glad I found them!! Compared to Levis/Wrangler the denin is softer, better quality and thefront pockets are deep er and roomier. These are now my favorite jeans...I have given my worn Wrabglers/Levis to Goodwill... FRANK S.
What a discovery I've made! Made in the US. Amazing high quality jeans made in Chicago, why are they called Dearborn? Who Cares! They are more superior quality to any jeans I've ever owned. BILL H.
Love the color and weight! Just one observation, not a complaint, they're roomier through the thighs than my other relaxed fit jeans. Thanks for building a great pair of jeans! AMY L.
These jeans are the real deal. I love that they were made in Chicago, and they are super comfortable. I will definitely order another pair soon. JEREMY W.
Old school craftsmanship–made to last you years. This is not your department store belt. I hemmed and hawed about whether or not to buy the belt while I was waiting for the gentleman to finish shortening my jeans. I'm glad I got it. The Chicago star on the end is a perfect accent, subtle but very meaningful for me. A great way to celebrate going down several pants sizes! Thor R.
Love this belt! Quality material and unique design of the loop strap. Also, really like the logo embossed on tip of the belt. The inside surface of the belt is rough leather, so it tends to stay in place well. That same surface does require a bit more effort to take the belt off. Ian H.
It's what you've been looking for. If you're looking for a jeans belt that you won't have to worry about for years to come - look no further! This is it - both in quality and in style. Priced reasonably, particularly if you consider it'll outlast three others. Easily. Jan Z. The quality and fit of all of Dearborn Denim's merchandise; the price point; and the amazing customer service are complimented by the wonderful store setting. Everything about their presentation and product is superior! David S.
I love the heft, suppleness, and feel of Dearborn's leather belts. They've quickly taken the center stage in my belt rotation, looking forward to more colors being in stock so I can expand the collection! Wesley B.
I had one brown belt for more than a decade and recently decided it needed to be retired. Your belt is a magnificent replacement that seems ready to last just as long. Thanks, Dearborn! J. O. Having a versatile belt that can be called upon for years to come is a necessity and this quality leather belt stands to be that belt. David L.
Love the belt, love helping a local Chicago business. I will be purchasing again from Dearborn Denim! Michael K.
Leather is high quality. Belt is of perfect thickness and has plenty of sizing holes to choose. Jason G.
It is a well made leather belt made of top quality leather. Also made in the USA. Jeff M.
You'd be hard pressed to find a better quality belt. Adam S.
Lucky to live close enough to DD&A store on Chicago's north side so I able to come in, see, touch and feel the belt (and jeans) before buying. It is my first belt from here and I'd highly recommend. Not sure I'll need to buy another because it's made so well. I'm on my second pair of Dearborn jeans only because I wear the first pair almost dai...Read More Andrew G.
I bought this belt in brown and came back for this one in black. I love this belt it goes great with Jeans. Ian F.
Heavy duty well-made belt feels like it will last for years and wear in nicely. Joe M.
A great belt that is comfortable, sturdy and attractive. Troy D.
True to size, nice quality thick leather. Time will tell if the buckle finish holds up over the years; that has been the weak point in many other belts I've owned. Mark S.
This is my DD&A second belt. Pairs nicely with my Dearborn jeans. Nice enough to wear with slacks for work as well. High quality, highly recommend. Matthew G.
Have all three now - great quality, sized right, fit the DDA jeans perfect! Michael M.
Love it, local, brilliant ! Michael W.
This is actually my third Dearborn belt, I loved the first one so much I decided to get a backup in case they ever stopped making them. Then when I saw they were making them in this beautiful burgundy color I just couldn't resist. This is the same high quality belt, made of thick leather, with solid brass hardware, and cut to the perfect length...you can't go wrong with this belt. Remy S.
This belt is great for jeans because it's a little wider than . most belts. The leather is very strong and yet supple. Richard G.